Original by Zoe Leonard from 1992. The collective reading I want a president... was initiated by artists Malin Arnell, Kajsa Dahlberg, Johanna Gustavsson and Fia-Stina Sandlund in conjunction with the general election in Sweden 2010. We wanted to gather activists, artists, friends and colleagues as a response to an increasingly neoliberal political climate in a country just about to give space in parliament to an upcoming fascist, racist and homophobic party. 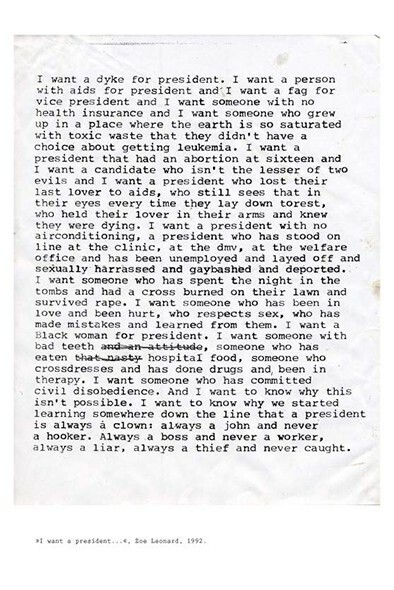 In collaboration with artist Zoe Leonard we made an adaptation of her text I want a president… (1992) in Swedish. On the day before the election we gathered at Sergels Torg in Stockholm, a big square famous for it’s many public manifestations, and read the text together, over and over again, for one hour. I want a president... produced a Poster to RUSSIA.